I haven’t yet had the opportunity to do too much travelling, so I rely on books such as this one to *briefly* rid me of all my wanderlust. It is always so much fun to explore and visualize countries through books, and I adore feeling like I’m actually there, experiencing all of the events. Let me just say that I loved travelling through Europe with the characters of this cleverly written novel! In spite of some minor flaws, I absolutely loved this book and I can see myself remembering it for weeks, months, and maybe even years to come. Wanderlost basically follows a teenage protagonist named Aubree. Her sister Elizabeth was supposed to lead a tour bus in Europe one summer, but unforeseen circumstances cause her to have to quit. Hence, she secretly gives her job to Aubree, making her borrow her name. Aubree herself has barely done any travelling, and especially since she accidentally left her phone and all of her sister’s travel notes on the plane, she is very skeptical about the job. Will she be able to face it and as well not be revealed as really being Aubree instead of Elizabeth? Aubree, although she made some decisions I didn’t really appreciate, was still a likeable character. She was flawed, and that’s what I value the most because just like real life people, no character can be perfect. She did an amazing and courageous deed to support her sister when she needed it the most, and I know it wasn’t necessarily right to lie about who she was, but what mattered is that she was able to amuse the senior citizens on the tour bus and make them feel good. She did all of this without anything to guide her, which is spectacular! Sometimes she did complain, which I can completely understand, but pushing that aside, she was overall a great protagonist. In addition to Aubree, I loved getting to know the people on the tour bus. All of them were so unique and had the wackiest stories to share, and that was one of my absolute favourite things about this book! There was also a tad of romance between Aubree and this guy named Sam, and though I deemed it cute, I found it to be a bit unnecessary. But, to each their own. The story’s plot moved quickly and it was easy to follow, and to add on, its many events are entertaining and it was especially fun getting to travel along with Aubree and her newly found crew. I learned a lot about Europe and some of its most famous landmarks, and I am now more eager to visit some of its hottest spots in the future. 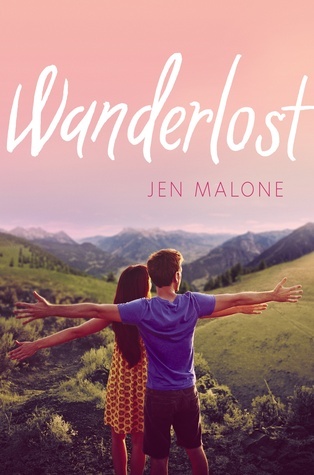 To sum everything up, Wanderlost was an incredibly fun read. The characters were unique but flawed, it was super awesome to “travel” and learn about Europe, and I loved the writing style. For anyone wishing to pack their bags and immediately travel to Europe, then pick up this novel and lose all your wanderlust- well, at least for the few hours you spend reading it.